The 2-3 inches of rain that fell yesterday and last night over the Santa Lucia Mountains has almost certainly brought this horrendous fire season to a definitive end. While it is possible that some smoldering remnants of the Chalk Fire (which was declared 100% contained on October 30), the Basin Complex Fire or the Indians Fire may have survived the night, it is now highly unlikely that they will ever rekindle. With acres burned still estimated at 16,269 and containment up to 98%, it’s starting to look like the Chalk Fire may finally be history (hopefully for real this time). Lots of rock still sliding down onto the Highway, though, so use extra caution – especially on the stretch just south of Lime Kiln Creek. With the burn out along the highway wrapping up, the fire seems to be entering another quiet phase. The MODIS satellites have found no new heat in the past 12 hours. Acres burned are up to 16,269, containment is back up to 93% and miles of fire line to build are down to 1.5. Firefighting efforts over the past few days have focused on containing the fire within new dozer lines and conducting burn out operations designed to keep the fire away from the Hermitage and other structures. The new dozer lines are partially within the Wilderness (no Act of Congress required). Depending on which page of Inciweb you read, the fire has now burned either 15,359 acres and is 80% contained or has burned 15,568 acres and is 83% contained. They say there are 7.5 miles of fire line still to build. 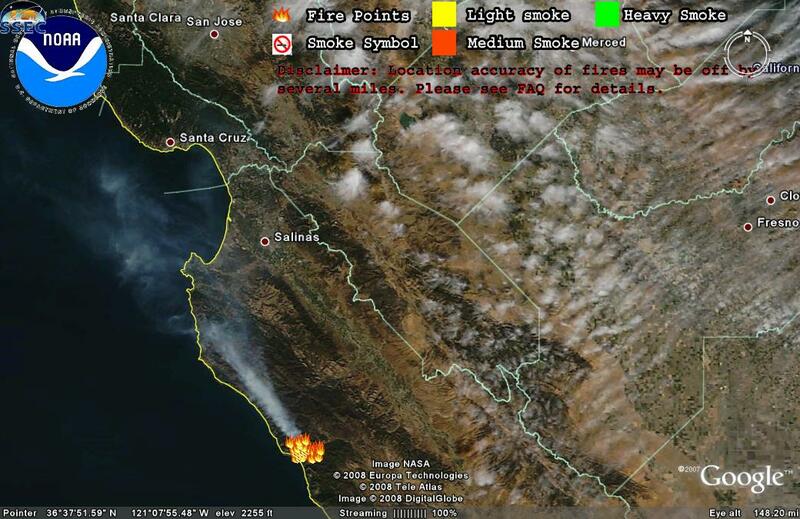 As expected, the heavy marine layer that moved in Friday night slowed the spread of the fire considerably. The Forest Service even claims an inch of “rain” fell on the coast. MODIS has detected no new heat since the arrival of the marine layer. The full extent of the fire’s advance on Thursday and Friday has become a bit clearer, though, as Inciweb is now reporting 13,410 acres burned and 80% containment (with 6.9 miles of fireline to build). Containment is now expected on November 1. Most of this weekend’s firefighting activity has focused on reopening the dozer lines protecting the New Camaldoli Hermitage (which were just rehabbed after being opened during the Basin Complex Fire). Meanwhile, we assume, the higher elevation portions of the fire are working their way toward, or into, the Big Creek watershed at whatever speed the relatively damp conditions allow. Let’s hope they get a handle on it before hot, dry conditions return. Inciweb now says 12,010 acres have burned and has ever-so-slightly reduced the containment estimate to 93% (we lack confidence that their mapping is accurate enough to make a 1 percentage point change in containment meaningful, but make of it what you will). In any event, large volumes of smoke continue to make their way north from the scene of the fire. Hopefully an increasingly thick marine layer will stop the fire from burning into inhabited areas tonight. Sounds like they may be a bit worried about holding the Lime Kiln to Twin Peak line. An evacuation warning has been issued for Lime Kiln State Park and the New Camaldoli Hermitage. See Inciweb for details. We wouldn’t worry about the heat detections just outside the Lime Kiln/Twin Peak hand line. MODIS isn’t that exact. Most likely, those heat detections represent the beginning of burn out operations along that line. Inciweb reported last night that burn out operations along this line and along another hand line from Twin Peak to Cone Peak are possible today. Well the Chalk Fire doesn’t look much like a fire that’s going to be fully contained by tomorrow. It’s been sending up smoke plumes today tall enough to be visible from the shores of Monterey Bay. Inciweb hasn’t been updated in nearly 24 hours, and the last we heard from them the fire was smoldering in the Hare Creek watershed. 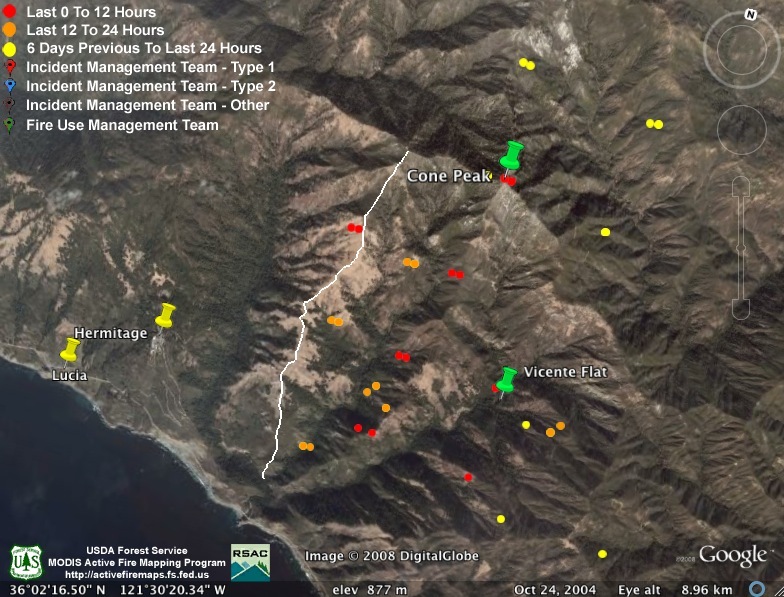 Big Sur Kate began reporting this morning that the fire along Hare Creek was flaring up and heading toward Cone Peak. If MODIS is correct, it is now well past Cone Peak and burning across a wide portion of the upper San Antonio River drainage. Quite an active day indeed, although there are reports that some of this burning may be part of a burn out operation (which part isn’t clear). The white line to the left of Cone Peak is the upper end of the Lime Kiln to Twin Peak hand line. Hare Creek is the lower left-hand drainage. The Chalk Fire flare up still seems to be active and, while Inciweb is claiming 97% containment, they have raised the acres burned to 11,310 and are talking about fire spotting across Hare Creek. That Lime Kiln to Twin Peak hand line may come in handy after all. On the other hand, they’re still predicting full containment by Friday. 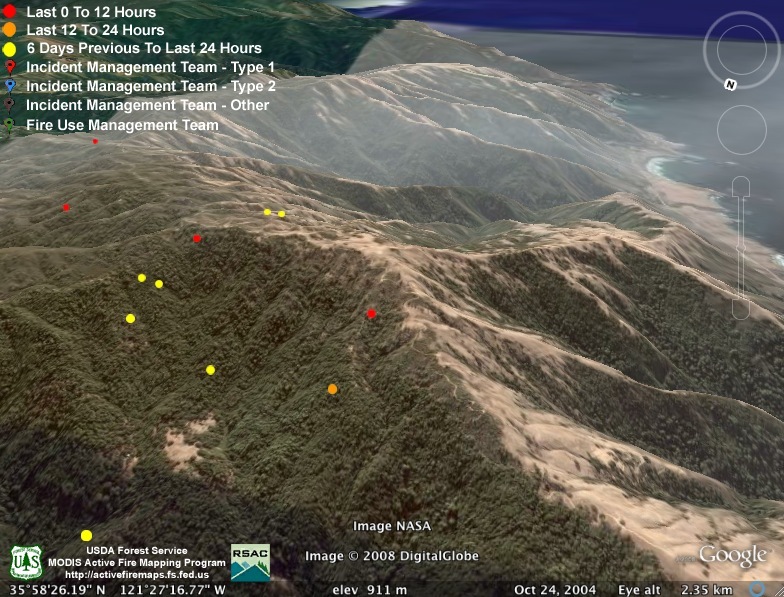 Meanwhile, as many as three new fires apparently broke out today in Big Sur. The northern portion of the Chalk Fire flared up yesterday, but we understand the flames are well within the containment lines. The flare up is still active this morning. A Red Flag warning has been issued for today and Saturday (due to wind) in the fire area, but fire activity is still diminishing (with containment now up to 84%) and, with no expansion of the fire perimeter since last Saturday’s rain, we doubt we’ll be seeing any new expansion now. More accurate mapping has lowered the estimate of acres burned to 11,189. The containment estimate is still holding at 67%. With no significant fire activity since Saturday’s rains, many sections of the fire appear to have gone out on their own without regard to whether they were “contained” or not. But the Forest Service can’t rely on the fire not rekindling, of course, so monitoring and mop up is bound to continue for some time to come. The hot weather over the past couple of days certainly emphasizes how lucky it was that the rain came when it did …. The containment estimate is up to 67% today and the estimate of acres burned is holding at 12,168. Here’s today’s IAP (and we’ll try to actually link to today’s this time). Since last we wrote, the estimate of acres burned has been increased to 12,168 and the containment estimate has been raised to 37%. By all reports, the fire remains subdued following yesterday’s rain. The improving situation is reflected in today’s IAP, which reveals a new, more aggressive, objective of keeping the fire south of the Carrizo Trail. We’re actually kind of pleased to learn that the Forest Service is aware of the existence of the Carrizo Trail. They dropped it as an official trail decades ago and it rarely appears on maps anymore. We wonder if this means they’re going to brush it out? 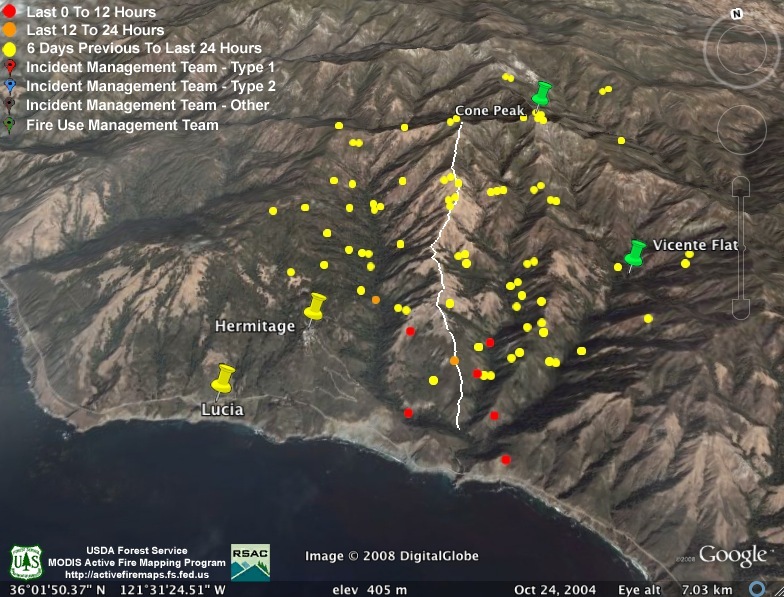 MODIS still hasn’t found any hotspots today and Big Sur Kate has done such a good job of cataloging Inciweb’s latest errors that we won’t bother to repeat them here. Let us just say that considering that they release such limited amounts of information and considering how long they wait to release it and considering that they have a professional staff of “information officers,” we can’t imagine what prevents them from getting the information they do release right. And telling people that burn out operations are taking place in areas where they are not is not a small error. People live in these places and when they read that the area they live in is on fire (or that the Forest Service thinks it’s on fire) it gets them upset. Current Status: The west flank of the fire has reached Highway 1 between Lime Kiln and Hare Canyon. Firefighters have worked hard to keep the fire uphill and away from the highway, and to protect vegetation along the road as a barrier to rolling debris. Crews are building a handline from Lime Kiln to Twin Peak. Other crews continue to prepare and protect structures at Prewitt Ridge, Mill Creek and Lime Kiln State Campground. The fire continues to spread northeast at a moderate rate. 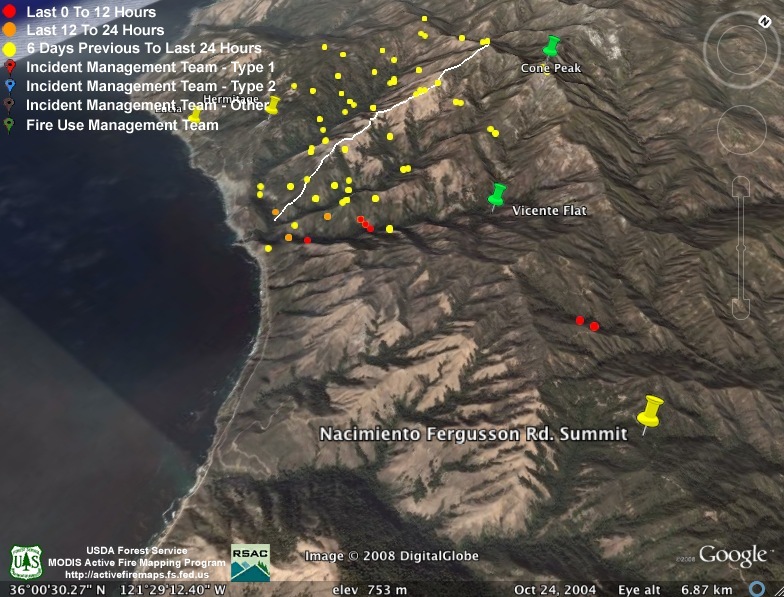 On the northeast flank, the fire is established in the Ventana Wilderness where challenges include extremely steep terrain and limited opportunities to construct containment lines next to the fire’s edge. On the south side of the fire, crews completed burning operations along Willow Creek Rd and McKern Rd to improve existing line. A hand line from Lime Kiln to Twin Peak … well we guess that is kind of a tacit admission that the plan to stop the fire south of the Vicente Trail hasn’t worked out. We just hope this hand line turns out to be more tangible than the one they said they were building north of the fire last weekend. Otherwise, Big Creek will be burning. And, as of now, Big Creek is the only significant watershed between Pacific Valley and the Little Sur River that hasn’t burned! Oh yeah, almost forgot. Here’s today’s IAP. The fire continues to be most active on the southeast flank. On the west flank, the fire is approaching Highway 1 between Pacific Valley and Limeklin. Cooler temperature and higher humidity will help fire fighters to hold the line at Highway 1. Crews will continue to provide structure protection on Prewitt Ridge and in the Pacific Valley and Limeklin areas. On the north east flank, the fire continues to progress slowly with a moderate rate of spread in the Ventana Wilderness. Extra caution is advised while driving on Highway 1 in the area of the fire, due to debris and the deployment of emergency equipment and crews. Elsewhere, the burning is apparently too low key to be seen by the satellites, but that doesn’t mean the fire isn’t moving forward. Many people report fire creeping slowly down the hill toward Highway One near Hare Creek. Whatever fire is burning out there today (and, judging by the smoke, there’s fire burning somewhere) is still invisible to MODIS. There have been no new heat detections for quite some time now. We do have today’s IAP to share with you, though. Inciweb is now reporting 7,079 acres burned and 20% containment. 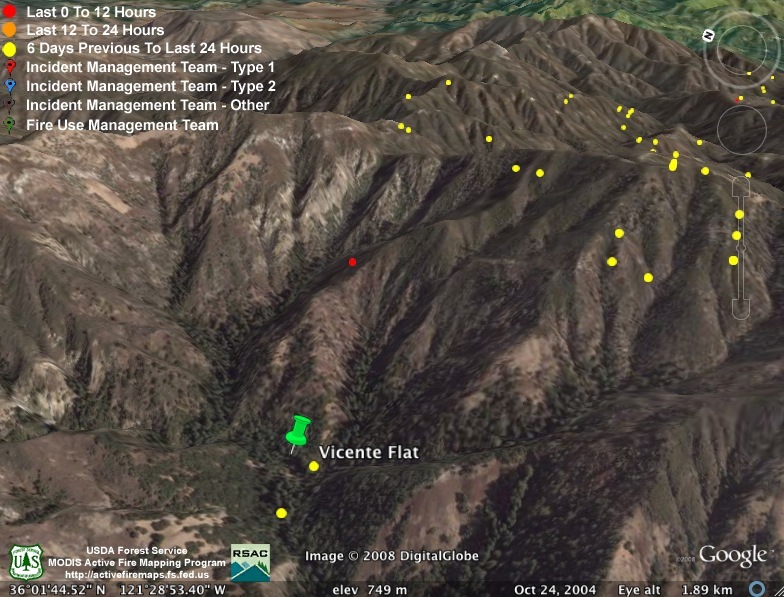 The latest MODIS pass found no new heat detections, suggesting that the fire had a fairly quiet night. Things may pick up again today, of course, but the higher humidity that’s already setting in and the rain forecast for tomorrow and/or Saturday will probably do a lot to reduce the rate of burning. This entry was posted on Sunday, September 28th, 2008 at 8:19 am and is filed under Big Sur, Fire, Flood & Apocalypse, Santa Lucias. You can follow any responses to this entry through the RSS 2.0 feed. You can leave a response, or trackback from your own site. Thanks, XT. No online or hotline “official” info yet, so I am putting it together from on the ground reports and visual observations. Trying to verify what I hear or read, but it is difficult. I do know the “official” reports of 30 acres are WAY off the mark. Unofficially, I’ve heard 200-300 acres, but I’ve watched the plumes grow considerably in the last hour. I’ve found nothing on GeoMac yet either. All be safe down there! This afternoon will tell the tale, Kate… if they can’t get their arms around it, and the wind shows up, it could get ugly heading toward Hunter Liggett mas pronto. the traditional media seemed not to be reporting this fire, does anyone know why? We were at the Hermitage and awoke to ashes on our cars Sunday morning, and a brown sky, we KNEW something had gone on but didn’t know how close. I hope and pray that all creatures great and small will get through this and our friends at the Hermitage and beyond. Betty Withrow reported today that the fire is heading south, but had not yet reached the creek. That was approximately 10 (accurate time to 1/2 hour on my blog). Also, a secondary dozer line is being put in off my property down Home Ridge, letting out just south of PV Station. Fire did make the NPR news and KCBS out of SF. Smoke down here,near the SLO county line and extending south over Patty’s daddy’s Ranch. Hoping the Santanna doesn’t come up. Planning to drive to N CA for the fall blacksmith conference tomorrow, but worried about leaving. 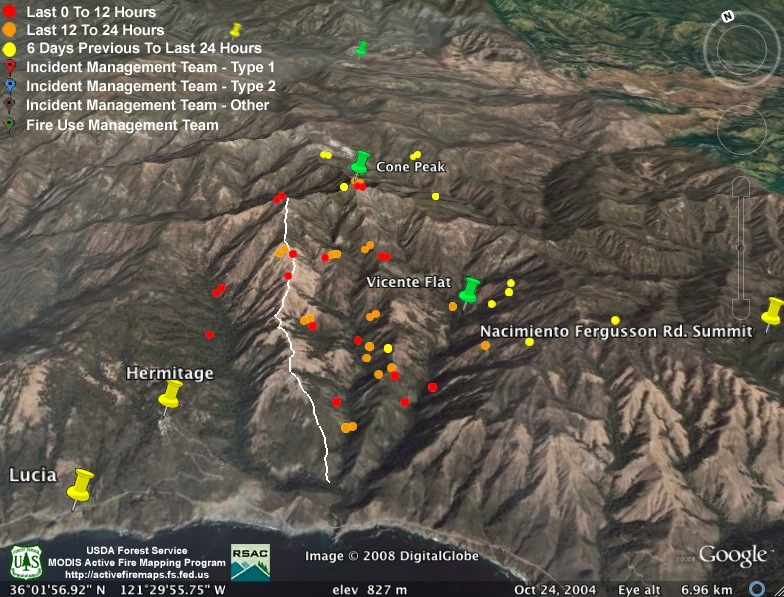 According to the USFS supervisor working in Big Creek Reserve at the moment (I worked with him during the Basin Fire as well, so good to see a familiar face-got a hold of him through the IAP you posted-thanks! ), there is no hand line being build along the Vicente Flat-San Antonio trail. Don’t believe everything you read, he said. A fact I can confirm with you is that they are building a hand line here in the Reserve and will use that plus our road to backfire and protect our structures and Bob and Joey’s house down at Circle M when (if) the fire gets here. 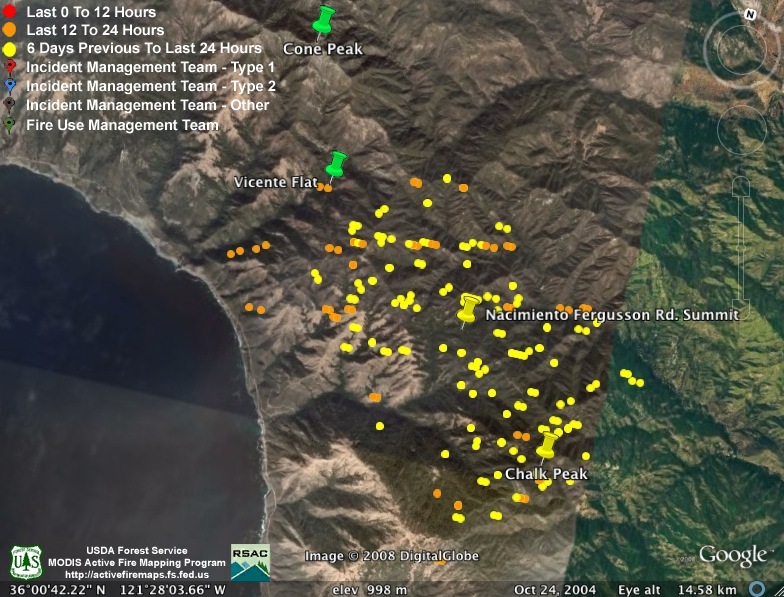 Unfortunately, and things could change, they are preparing for the fire to round Cone Peak, probably from the east but maybe from the west and drop into Devils Creek or Vicente Creek. They are re-opening the fire break along the hermitage road, up over Lucia and down the ridge south of Vicente Creek on Circle M Ranch. This way, the fire can burn north, right up to Dolan Ridge and into the black of the Basin Fire. 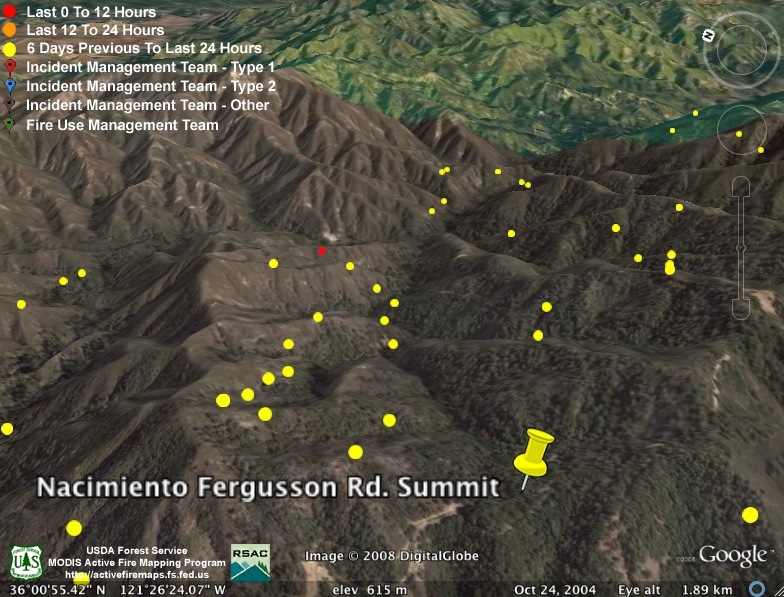 His story is that the fire is hung up above Fresno campground along the ridge there but that they have kept it below the cone peak road just west so far. Now, you don’t have to take his or my word for it, call it “contingency” but here at Big Creek they are fully expecting this fire to burn north to the Basin and Indians perimeters. We shall see. We’re just glad we have good support here on the ground and we’re already pretty prepared from our experience with the Basin Fire being stopped on Dolan Ridge. Just got back from the highway along Lucia to Mill Creek. I could see the glow from Big Creek so went to check. Lots of fire spilling down all over between Hare and Kirk canyons. It’s fairly complete across the ridge (Espinosa?) and those spurs leading down to the coast. I could definitely see light coming from Hare Canyon. Up Hare to the right and then a little left, looking from the bridge at Limekiln. I agree that clear information would be nice to have. We are so used to knowing fine details about the area while they use quite a broad brush to describe what they’re doing and where they’re working. Bit why be too specific when nothing is for certain? Best is seeing with your own eyes though. I hope the IAP is right about Vicente trail. If crews are working on that line then they must be coming down from cone peak road because I haven’t seen any crew trucks at the trailhead at Kirk Creek. So, only they know. We shall stay in the dark until we see the fire either stop at Hare or keep going north. They still have to hold that fire east of the cone peak road all the way up. Way up, speaking from a northwest-centric point of view of course. Based on the lethargic way the fire seems to be moving south, I have high hopes for them keeping it north of Prewitt. I’ll keep my fingers crossed. That Oct. 2 6pm perimeter map on inciweb is really inadequate. I think everyone would naturally appreciate a map with at least enough resolution to read it. The maps from Sept. 28 had good resolution. What happened? 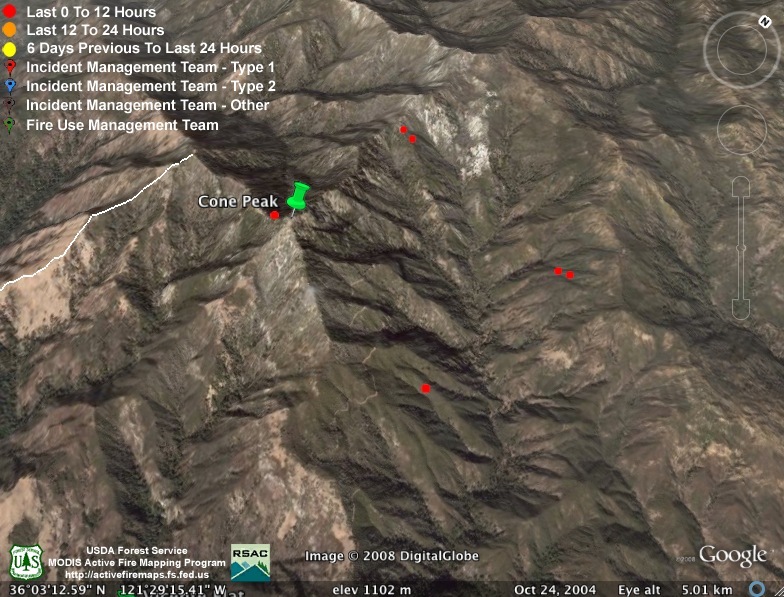 8 pm, XT, you want to go to my blog and help me identify exactly where these new flames are, south and east of Cone Peak? Seeing is believing! I drive down to Mill Creek every night now. Tonight the fire was a the highway at Kirk Creek. There were fire crews monitoring it. The fire is now visible up Mill Creek on the north side and a plume could be seen just over the first spur on the south side, looking from the bridge. Limekiln canyon is very smoky. But so is Big Creek. Xasuan, thanks so much for posting the IAP reports. They are very helpful. I learned that today Big Creek and Limekiln SP have their own Division. Crews are removing the rehab material from Dolan Ridge and finishing the fire break prep on the south side of Big Creek, above our structures. Notice that Division A, the one in charge of the fire in San Antonio watershed is unstaffed today. The report on inciweb also states that the fire is established there. Those who have looked down from Cone Peak road to the east into San Antonio know how steep it is. It would be so dangerous to try and go down there after fire. It seems they are taking this into consideration. Oh yeah, I saw an example of “rollout” tonight up Kirk Creek. There was a big pop from way up the canyon and then tons of embers and burning debris rolled about 300 feet down the mountainside into the canyon bottom. I could see how trying to maintain a break with a fire backing down steep terrain is extremely dangerous and susceptible. More dangers that the crews are facing. I also heard a huge crash come out of the very lower part of the canyon, just up from the highway, as a tree came down. Made me realize how tentative conditions are in a burning forest. Hi XT, I investigated this “direct line from Hwy 1 to Twin Peak”, both by phone and visually. It is true and you have the route correct on your google earth map. Six crew trucks were parked in the pullout just north of the big slide at the bottom of Twitchell’s trail, north of Limekiln SP. They were building that fire break up Stone Ridge toward Twin Peak. I drove up to an overlook along the hermitage road and had a wonderful conversation with a group of USFS firefighters, including a captain. Their crews got about halfway to Twin Peak today and hope to finish tomorrow. The plan tomorrow would be to come down off the coast ridge, along the cone peak trail until it meets the saddle between there and twin peak. If they can do it, they will move across to twin peak and tie in to where they got to today (Stone Ridge summit at 2449 Elevation). If the ground crews can’t do the upper section between twin peak and cone peak, they hope to just “paint it” with air support. 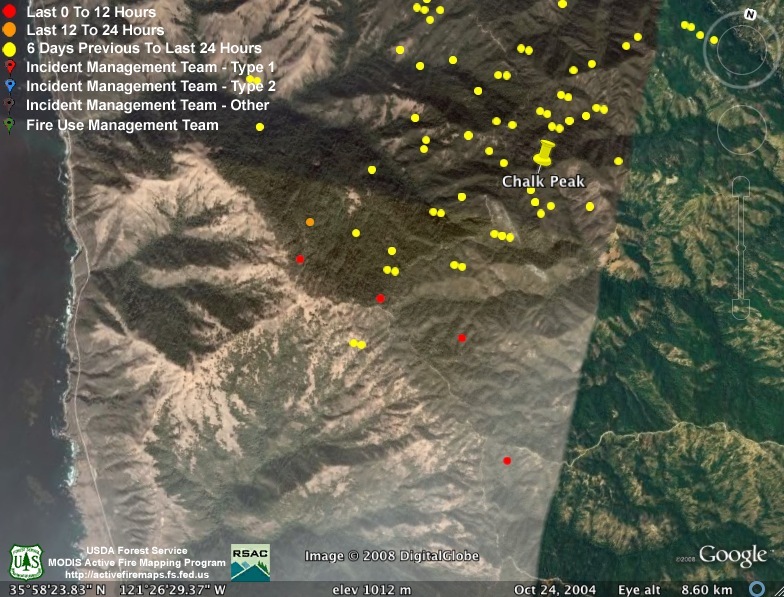 This fire is burning in 9 year fuels this time, instead of much older fuels back in the Kirk Complex fire of 1999. So they feel more confident about this working this time (it was not an option given the conditions in 1999). IC is responding to a lot of community and political pressure to keep any more coastal watersheds and slopes above the highway from burning. So they are doing a lot of direct attack and trying to keep the fire away from 1. If this can be pulled off then the fire will be taken from Cone Peak, down into Limekiln and hopefully just put it out down in the dampness of the creek. 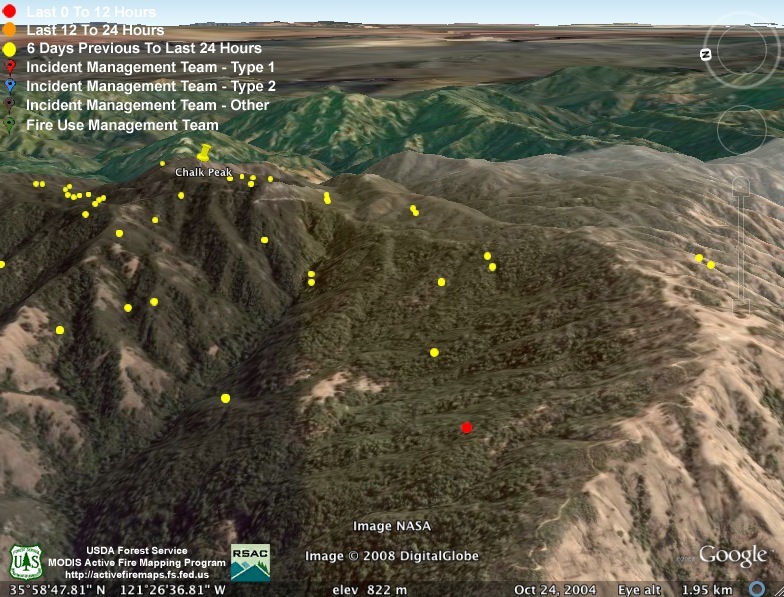 On the east side of cone, they plan to run it up the coast ridge into the Basin perimeter and out to the Indians perimeter on Hunter Liggett. The fire has moved lower down Hare canyon now. That and a few wisps high above the highway between Limekiln and Kirk Creek is all you can see from the coast now. I also got news from those firefighters and Jeff Kwasny (USFS Resource Advisor) that the fire break along Prewitt and out to McKern road has been successful. I guess another 8% successful. Right on, XT! You can’t imagine the concerns over a burnout that is misreported. That is major! Confusing the closure of day use areas, that is minor. Fortunately, locals know to contact me, re: confusions like this, and I can and do set USFS straight. I am SO glad I rolled out personally, and checked out all the areas USFS was confused about last night. But you know, I am only one person, and one tired person at that. 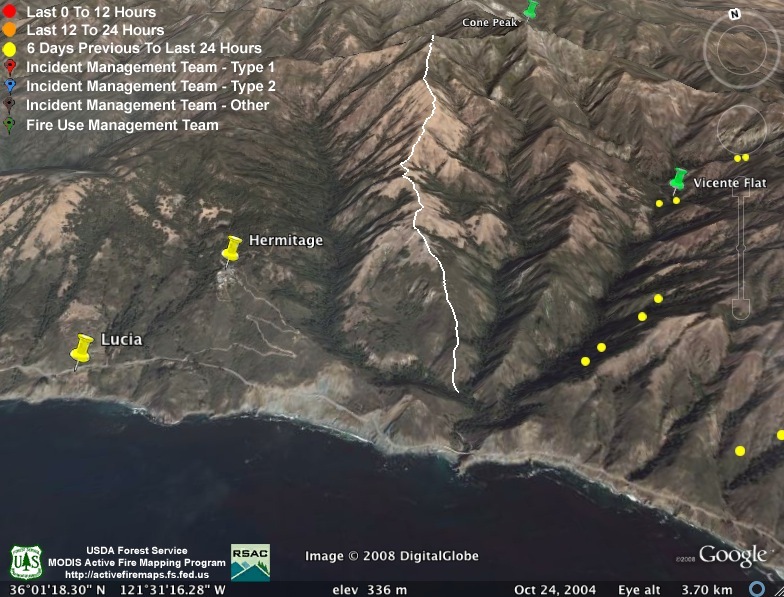 I am committed to staying on this until all threats are removed from the western slopes of the Santa Lucias. I don’t have the energy to cover the eastern slopes. I will leave that responsibility to someone else. oops, “today’s IAP” link is hot linked to yesterdays.